A quick and easy recipe to make your own lipbalm! This is something I had wanted to do for quite a while last year. 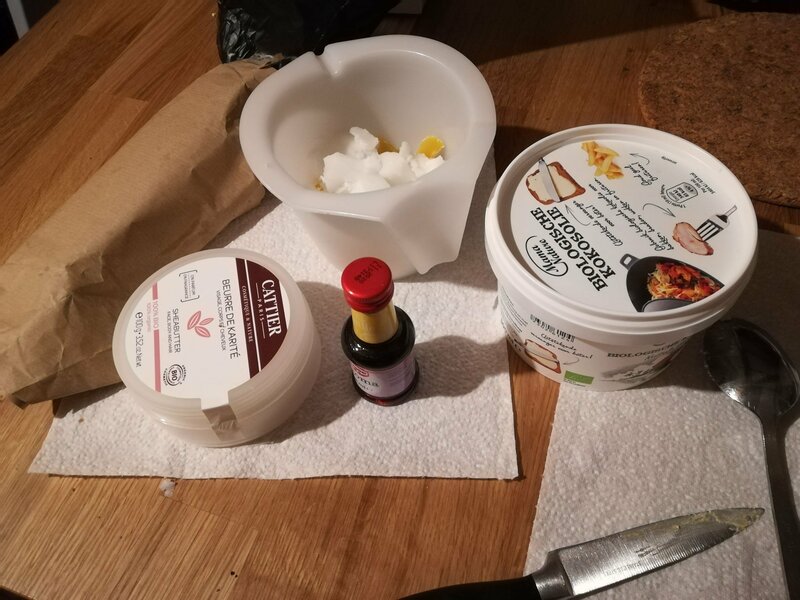 I have searched many websites for a quick and easy way to create your own lipbalm, but also hand creme and scrub. I haven’t found a good way to make hand creme yet. Atleast none that don’t leave a fatty layer (which is just fine for extra dry skin by the way!) or need exotic/expensive ingredients, but I did find easy scrub and lipbalm. Here’s the free bonus: Easy facial scrub is basically just baking soda (If you’re interested in more about that, just tell me and I’ll write up a little article about it). There, that’s one out of the way, now onto the lipbalm! For this, you’ll need a couple of ingredients you might not already have lying around. Namely shea butter and beeswax. You also need coconut oil. It’s an easy recipe, quick to make and you just need to decide on your containers. 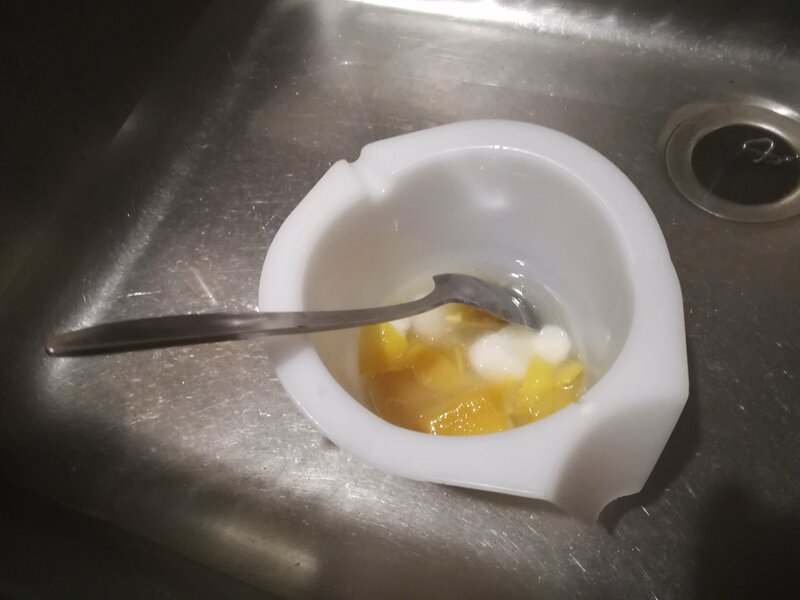 I first used really small bowls, because I didn’t have much else. 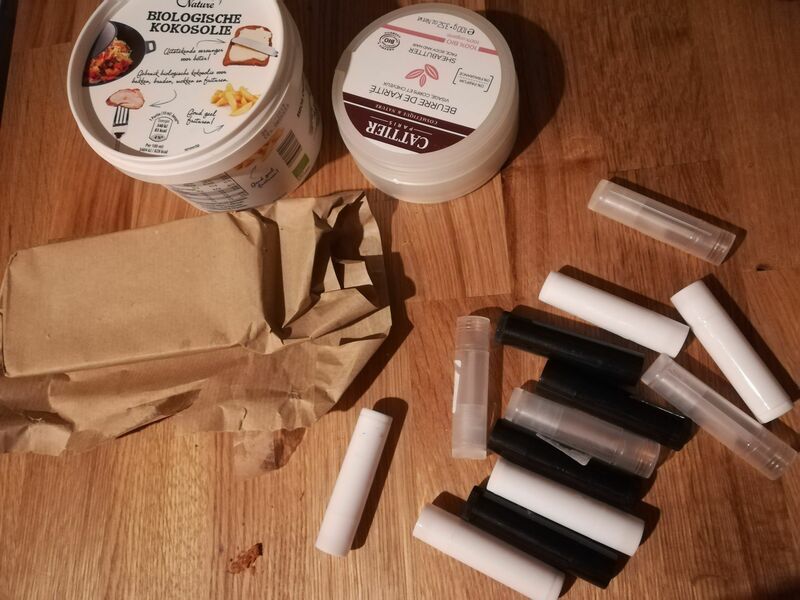 Later I ordered empty tubes online (AliExpress has cheap ones), because I just love to have an easy stick for my lip balm. 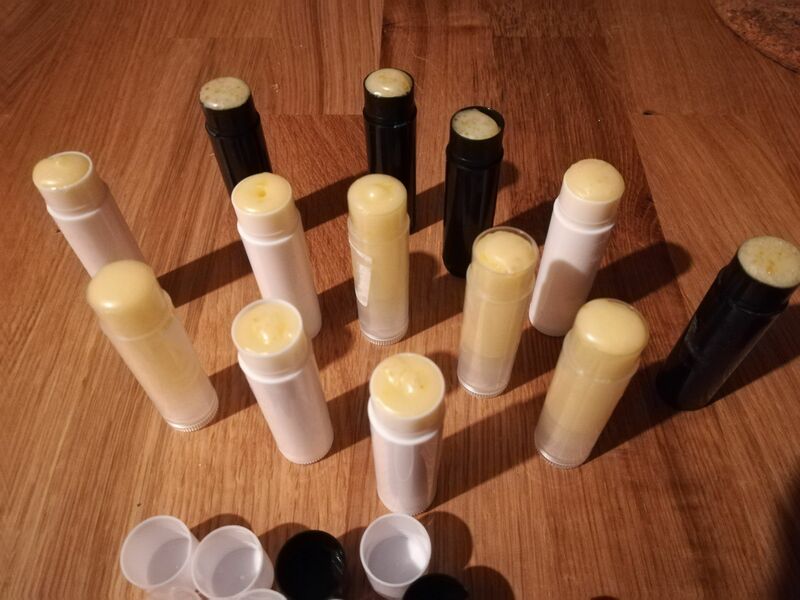 With this recipe, I managed to fill up 13 lip balm tubes, which was all I had. I could have probably filled another one or two tubes if I had them. What’s awesome about making your own lipbalm is you know exactly what’s in it! I remember a little while ago, many news articles about how bad retail lip balm could be for your health, so I was glad to have my own now. It is also a nice gift idea for your friends and family. I’ve been using this for over half a year now and I’m not going back to store-bought ones. Neither is my mum apparently, because she finished her last batch and asked me to make more! Now for the shelve life, I can’t promise you much. All I can tell you is I’ve been using the same batch for over half a year now and they are still well. Haven’t gone bad at all. One thing to keep in mind: the colder it is, the harder the lipbalm gets and the warmer it is, the softer your lipbalm gets, due to its ingredients. Nothing wrong with it, you just need to know! Now before we get to the recipe, there are two ways of melting everything down. Microwave or hot water bath. I suggest the microwave if you have a microwave-safe container. The beeswax can be quite annoying to melt down in a hot water bath. If you use that, cover up your container to try and keep more warmth in and refresh (well, reheat) your water a few times. You’ll basically be stirring and refreshing a lot by the end. Optional: a couple of drops of your favorite flavor oil to give a nice smell (I use either vanilla, orange, or mint extract). Put everything except the flavor oil inside an appropriate container for either of these two options: Microwave or a hot water bath. Either microwave your ingredients with 30 second intervals while stiring inbetween, or set your container in a hot water bath and stir once in a while. Wait until everything is completely melted and mixed (you might have to refill your hot water bath, because the beeswax takes a while to melt and needs a higher temperature than coconut oil and shea butter). Add your flavor oil and mix well (this could harden out a bit, just stir and maybe reheat for a couple of seconds). Pour your mixture into your tubes, bowls, pots, whatever you picked and wait until it is cooled off completely. There you go, your own lipbalm!